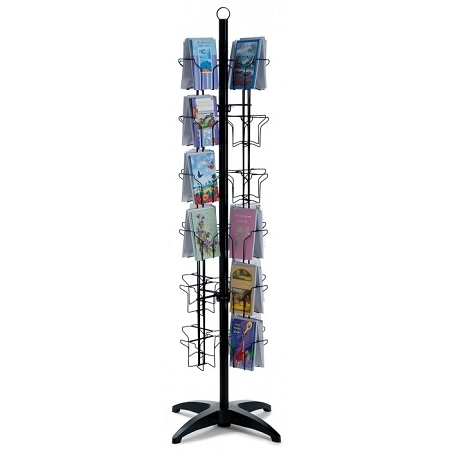 This floor spinner rack holds 48 dozen standard size 5"W x 7-3/4"H greeting cards. Ships knocked-down with four 12-pocket wing assemblies. Pockets are 5-9/16"W x 8-3/4"H with a depth of 1-1/2", and are designed to holds twelve 5"W x 7-3/4"H cards per pocket. Features pocket bottoms that are slanted for best card viewing angle and to enable gravity feeding of cards. Unit stands 68" tall, and has a 16" spinning diameter. Durable white or black powder-coat finish. 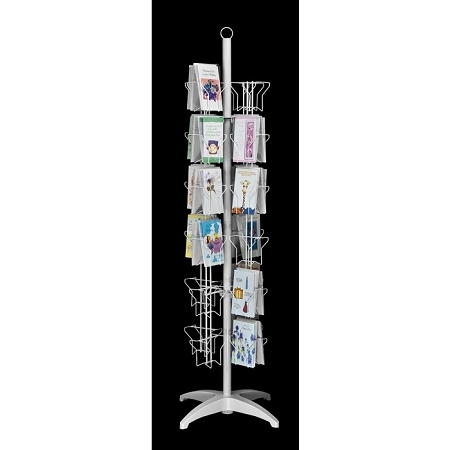 18 Pocket Wire Spinner Counter Greeting Card Display 5'x7"